SK: Was that as enjoyable to play in as it looked, there seemed to be a more positive dynamic to the performance? FK: For us, one thing we’ve spoken about is that we want to play football. With Phil coming in he’s given us that confidence to try things. He’s more, ‘If you don’t try it I’m going to be annoyed with you’, rather than don’t try it at all. The teams at WSL level want to play football so when you come into the national side that’s exactly what you want to be doing. Everyone’s full of confidence and getting a result like that is only going to be positive going into a game against Germany. SK: So, after one game, that’s the one thing you would say that the new coach has brought to the team? FK: Yes, the confidence to play football. To try things. Towards the end Mark [Sampson] was trying to get that into us too – wanting us to play more football – after the Euros. And importantly, everyone knows that the players around you, if you lose the ball, your team mates are going to get back in and win the ball back for you. SK: Has having such competitive and tight games in the league recently – particularly against Manchester City – meant you’re sharp coming into this tournament? FK: Yes, I think so. In our league it’s getting better and better, every year teams are progressing and I think it’s only positive for the national team. 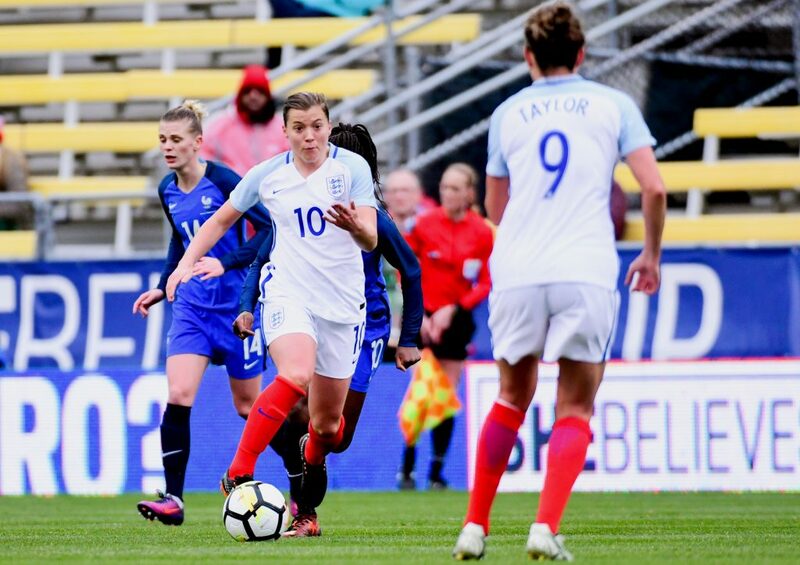 Obviously it’s a shame with the injuries that have happened but looking at the players that have come in – like Abbie McManus getting on and getting her first cap and doing really well – it shows how the league is progressing and coming into this environment it does make it more competitive and we’re a lot sharper and quicker. SK: Are you feeling like one of the older more established players now?! FK: I remember speaking to Alex Greenwood about it the other day, I said, “God, I feel really old now!” I’m one of the ones that’s been around a few years now. Obviously now its something I’ve got to take on, being one of the more experienced players, which is bizarre because I’m only 24 and I’ve only been in the squad a few years. 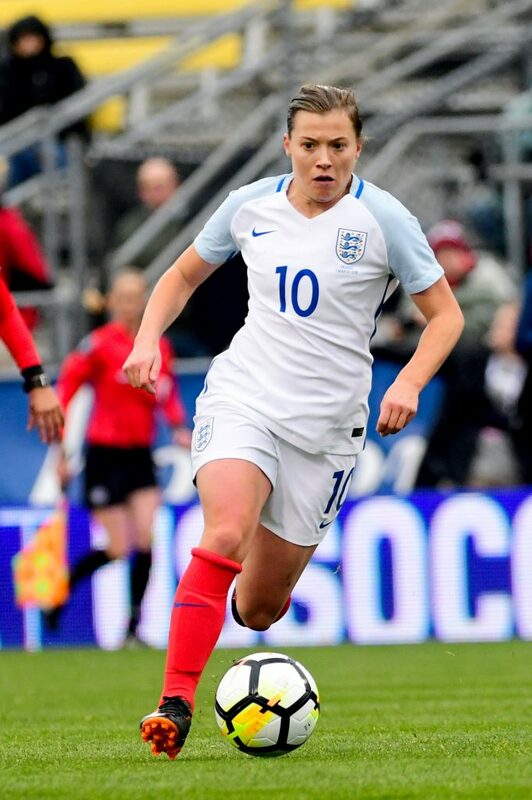 Now I have to try and help nurture the girls that are coming through and I think it’s a great group that we’ve got, everyone loves spending time with each other, having a laugh on and off the pitch and I think that’s really important. SK: You must be feeling pretty good fitness-wise and form-wise at the moment, scoring and creating too? FK: Yeah for me to score a goal for England, that wasn’t a penalty, was nice! One thing I want is to be involved as much as possible, I like to be on the ball, to create stuff, even if I make a run and don’t get the ball, whether I’ve got someone who is pressing me or people around me, so overall yes, I’m feeling happy. Obviously today was a test of my fitness, playing in more of a midfield role. I think I took it into my stride, tried to make the position my own. It was a real wake up for me to be like ‘I can actually do this’, I can actually run for 75 minutes and not just chase the ball backwards and forwards. So that was nice. SK: Do you think France we a little complacent or perhaps underestimated you at all? FK: No, I don’t think so. They’re going through a transition. A new manager, trying new things. For us, one thing is we can’t get ahead of ourselves. Every game in this tournament is going to be a different challenge. Germany will be just as hard and USA just as hard, so we need to make sure we keep our feet on the ground and we get on the training pitch and work hard like we have done in the last few days. SK: What were the conditions like? FK: It was difficult. It was great for us to have the wind for the first half. That really put the pressure on France and then we just needed to make sure that we shut up shop and getting the goal just after half time so quickly dimmed their confidence. So yeah it was difficult and you could ask any of the girls and they’d agree that they’re not the best kind of conditions that you want to be playing in. FK: Yes that’s one word that we’ve really pushed around the camp. We want to be ruthless, we want to be deadly in front of goal. We’ve got so many goalscorers in different positions and every goal today was different and that just shows what an attacking threat we possess going forward and if we really utilise that then we can kill teams off.